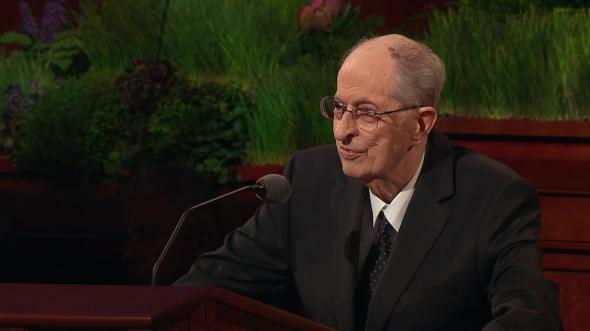 My dear brothers and sisters—yes, ye are all brothers and sisters—the counsel of my Brethren, as well as the beautiful music and the opening prayer, have made this a most inspirational meeting. Yes, the Lord has truly sustained me in this position, for which I am truly grateful. At the October 1976 general conference, the First Presidency and Quorum of the Twelve restructured the First Quorum of the Seventy. I have served as one of the Presidency of this quorum for the past seven years. 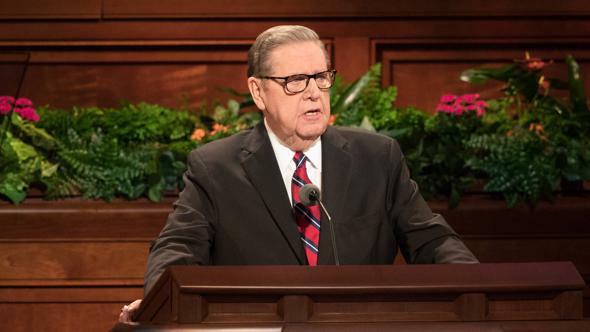 This has been a choice experience as our quorum of forty-seven members has served in many capacities both at the headquarters of the Church and throughout the world. I commend them for their dedication and effective service. As has just been explained, I have been called to be the president of the Washington (D.C.) Temple, and my wife, Helen, has been called to serve as matron of the temple. We are grateful for the confidence placed in us by our Father in Heaven, the First Presidency, and our Brethren. We approach this assignment with humble hearts and with full commitment to devote our best efforts to the building of the kingdom of God. We are living in a period in which there are wars and rumors of wars among nations and much hatred, conflict, and contention among people. It seems to me the most pressing need in the world today is peace—not only among nations, but also within families and in our social and business relationships. Jesus Christ is called the Prince of Peace (see Isa. 9:6), and his message is a message of peace to the individual and to the world. The gospel of Jesus Christ is the plan of life that will restore peace to the world, remove inner tensions and troubles, and bring happiness to the human soul. It is the greatest philosophy of life ever given to man. A mission of The Church of Jesus Christ of Latter-day Saints is to establish this peace and happiness in the hearts and homes of the people. Certainly one of the greatest messages given to man by Jesus Christ is known as the Sermon on the Mount. Practically all of the basic principles in man’s relationship with others are contained in this great sermon. Part of this sermon is referred to as the Beatitudes, and these begin with the word Blessed. These Beatitudes outline conditions which bring about peace and happiness. 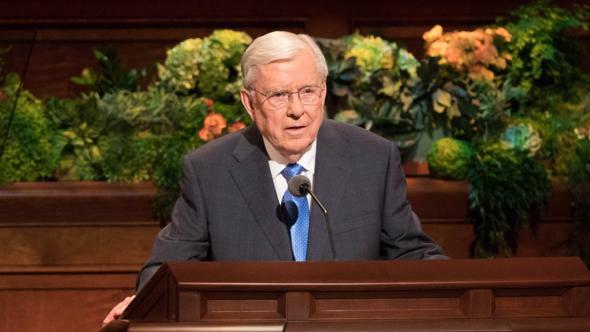 In this great sermon, the Savior admonished all to be peacemakers as he said, “Blessed are the peacemakers: for they shall be called the children of God.” (Matt. 5:9.) Blessed means happy, favored, and glorified. If ever there was a time when we needed peacemakers, it is today; today seems to be a most appropriate time to discuss what we might do to assist in establishing peace, at least within our relationships. Have you ever wondered how you could be a peacemaker? I would like to mention a few possibilities. Really, our opportunities are unlimited. Certainly in our homes, as well as elsewhere, we can all be peacemakers by exhibiting love and goodwill, thus offsetting the evil of contention, envy, and jealousy. Where misunderstandings exist between children and parents we can encourage adjustments on the part of both. We can pray together for the spirit of peace. Homes can be seriously disrupted because of family strife. At times, husbands and wives in an atmosphere of contention destroy their own happiness as well as that of their children. Divorces seem to be continually increasing. Many of these divorces undoubtedly could have been avoided if peacemakers had been involved during periods of strife. An interesting example that I was closely associated with and which I have referred to previously was one in which several young adults became peacemakers in their homes. A very wise bishop called several young people into his office and said to them: “I would like you to help me in an experiment. I would like to prove the impact and influence of one member on the spirit of the family. For one month, I would like each of you to be the peacemaker in your home. Don’t say anything about this to your family, but be thoughtful, kind, and considerate. Be an example. Where there is quarreling or bickering among members of your family, do whatever you can to overcome these faults by creating an atmosphere of love, harmony, and helpfulness. It was a challenge for these young people, and they met the challenge in a wonderful way. I can promise you as you try this experiment and become a peacemaker in your home that the rewards will be most gratifying. Another way we can be a peacemaker both in our home and our social and business relationships is by avoiding criticism. Did you ever stop to think that every time you criticize, you are judging? An important part of forgiving is forgetting. In some ways, being able to forget is almost as valuable as being able to remember. Again, as one reviews the various areas of life’s activities and appreciates the many human inadequacies, the great value of patience is seen as an important part of being a peacemaker. Patience is truly a mighty virtue and can be developed as we become peacemakers and make up our mind to be patient within our own life as well as with others. I am grateful that the restored gospel of Jesus Christ incorporates the remarkable principle of patience. I am most thankful for the patience my Father in Heaven has evidenced with me in my life. Brothers and sisters, it is important to appreciate that the gospel has to be lived in order to be fully realized and its power received. I bear you my testimony that peace can be enjoyed by individuals, families, and society in general, as well as by nations as we live the principles of the restored gospel of Jesus Christ. 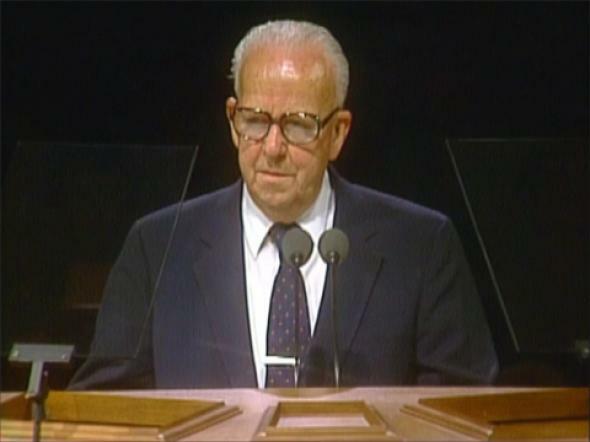 I rejoice in my knowledge that God the Father and his Son, Jesus Christ, live and appeared to the Prophet Joseph Smith, and that through the instrumentality of the Prophet Joseph Smith the fulness of the gospel of Jesus Christ and the power to act in the name of God has been restored and the Church reestablished on the earth and, further, that President Spencer W. Kimball is a living prophet. May the Lord’s choicest blessings be with him and may we have the courage and good judgment to follow his counsel and advice. May each of us in our daily lives assume the role of peacemaker that we may enjoy the peace that surpasseth all understanding, I pray in the name of Jesus Christ, amen.